The Ice Hotel is situated on the shores of the Torne River, in the old village of Jukkasjärvi in Swedish Lapland. Sweden’s Ice Hotel is built from scratch every year. A new design, new suites, a brand new reception – in fact everything in it is crisp and new. 10 000 tons of crystal clear ice from the ‘ice manufacturing plant’, the Torne River, and 30 000 tons of pure snow generously supplied by Mother Nature are needed to build the Ice Hotel every year. The hotel sleeps over 100 guests, and every bedroom is unique. 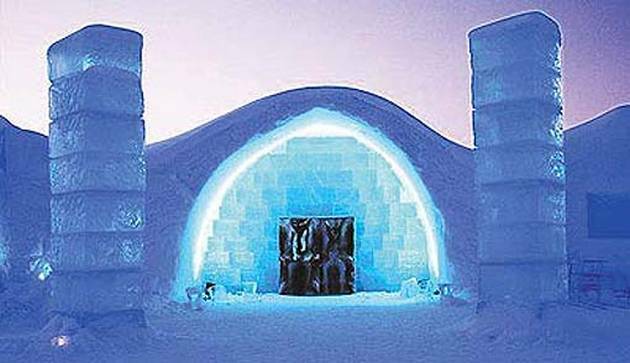 Covering more than 30,000 square feet, the Ice Hotel includes an Ice Chapel, the hotel itself, an ice art exhibition hall, a cinema and last but not least, the world famous ‘Absolut Ice Bar’. An over twenty-year journey from an Igloo of 60 square meters to the world’s largest hotel of ice and snow at about 5500 square meters. Welcome to Icehotel and Swedish Lapland. The world famous Icehotel has over 80 rooms built each year from snow and crystal clear ice, taken from the waters of the local river Torne. The Icehotel is available from mid-December to mid-April. For departures before early January, you can still watch some of the ice sculptures and artists at work, finishing off their creations and other aspects of the hotel, whilst you stay in a snow room. After that time you can see the completed hotel in all its glory and if you wish, upgrade to one of their stunning art suites, each individually designed and hand crafted by one of many artists who travel there from all over the world to help create the Icehotel each year. The sight, as you open the main, reindeer-skin clad doors, is simply breathtaking – a grand, ice pillared hallway illuminated by dazzling ice sculptures and spectacular ice-carved chandelier. The interior, at between -5°C to -8°C, actually feels quite pleasant, especially when outside temperatures can drop to around -37°C! Walk past several ice sculptures and imaginatively lit ice art towards one of the most popular rooms – the Absolut Ice Bar. With its vaulted ceiling, plenty of ice block seating and see-though bar, it serves an impressive range of colourful vodka cocktails, naturally served in chunky ice glasses. Hot cocktails are also available! The Icehotel Restaurant, situated just across the road from the main reception, offers an extensive breakfast and lunchtime buffet plus an à la carte dinner menu. It also houses a Champagne Bar and a more relaxed bar in the basement.